Happy Holidays from Booze Movies! The early talkie Rio Rita (1929) has often been sited as historically important for a number of reasons--1) This filming of the popular Flo Ziegfeld stage production was a forerunner of numerous stage-to-screen musicals--2) The last half hour of the film displayed an early use of two-strip Technicolor--and 3) The movie was the first to team popular comedians Bert Wheeler and Robert Woolsey, who would be second only to Laurel and Hardy in popularity during the 1930’s. However, prior critics have overlooked one other historically significant aspect of Rio Rita--4) The picture featured an early (if not the first) filmed demonstration of a stock device of screen comedy--a drink of near-deadly potency. The plot involves the attempts of a Captain of the Texas Rangers (John Boles) to capture a bandit known as the Kinkajou and to woo a pretty Mexican lass (Bebe Daniels). Things get a bit dicey when the Captain begins to suspect the girl’s brother (Don Alvarado) might be the bandit. At the same time a bootlegger (Bert Wheeler) visits Mexico with his lawyer (Robert Woolsey) in order to get a quickie divorce and remarried. Of course, none of this matters very much. It’s all just an excuse for a lot of singing and dancing. For a prohibition-era picture, an awful lot of alcohol is consumed in Rio Rita. Setting the story in Mexico allowed the characters to imbibe without fear of reprisals from the authorities. Still, the film is not really a Booze Movie through and through. Rio Rita gains its soused cinema status on the virtues of one particular scene, in which Wheeler and Woolsey get gloriously stinko on cognac, brandy, and old Aztec wine. The final beverage on the menu is a precursor of all of the supercharged cocktails that would follow, such as the Alaskan Polar Bear Heater (The Nutty Professor), Nasty Canasta’s Usual (Drip Along Daffy), and the Pan-Galatic Gargle Blaster (The Hitch Hikers Guide to the Galaxy). The old Aztec wine is so powerful that when Bert Wheeler pours it into a glass, the glass smokes and dissolves into nothing. Consequently, Bert is forced to slug the stuff directly from the bottle. The effect of the fluid is immediate. Wheeler barks like a dog and proceeds to converse in high-pitched baby talk. “Now that’s what I call whisky!” Woolsey observes, but he is reluctant to join his pal in ingesting the extreme elixir. However, when Bert begins seeing visions of a beautiful, disrobing blonde, Woolsey eagerly takes a swig. “Why, I know the girl!” Woolsey expounds soon after. 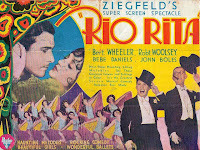 Wheeler and Woolsey’s antics are a secondary subplot in Rio Rita, but their superbly timed comic and musical performances steal the picture from romantic leads Bebe Daniels and John Boles. The only other cast member who really makes an impression is diminutive cutie, Dorothy Lee, who plays Bert Wheeler’s love interest. Short, spunky, and pretty, with a baby doll voice, Dottie was like Betty Boop brought to life. It is no wonder Bert and Bob brought her back to co-star in twelve more of their features. On the whole, Rio Rita shows its age. The story is melodramatic, the acting is amateurish, the filming is primitive, and the editing and continuity is choppy. Of course, the latter may be due to the fact that the film was released at 135 minutes, but the existing print only runs 103 minutes. Luckily, the old Aztec wine sequence survives intact. Potent Quotables--WAITER: Ah, but when you want some more brandy, just let me know. CHICK: No. This is a little weak for us. WAITER: Oh, I’ll take it away. ED: Leave it. Leave it. We’ll use it as a chaser. WAITER: If you want something really strong, try this. WAITER: This is a bottle of old Aztec wine. ED: Yeah? What’s it like? WAITER: Oh, I don’t know. I don’t dare drink it myself, so I cannot tell. 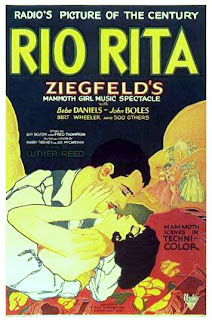 Video Availability--Rio Rita is available as a manufacture-on-demand DVD-R through The Warner Archive. 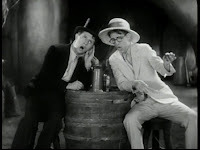 Similarly Sauced Cinema--Bert and Bob served spiked lemon soda in Caught Plastered (1931).